On this page you can see what is keeping me busy – musically speaking – and keep up to date with forthcoming performances and projects. If you would like this distilled into politely regular instalments direct to your inbox, why not sign up to my mailing list. 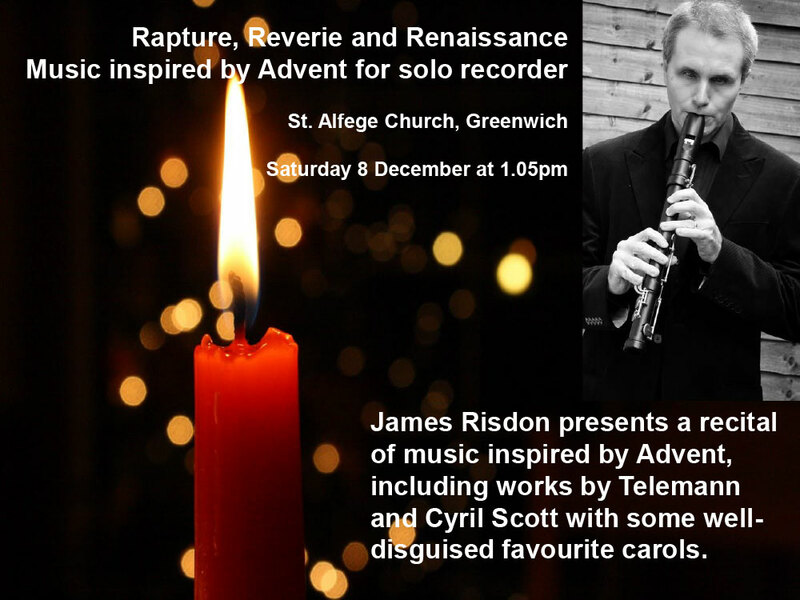 This short recital is my own antidote to the Christmas build-up! So, if you find yourself in London, craving the soft and seasonal strains of a lone recorder (and why wouldn’t you?) it would be wonderful to see you. I shall be performing a short set for recorder and piano as part of the Cambridge Rare Disease Network’s RareFest conference at Cambridge Guildhall. 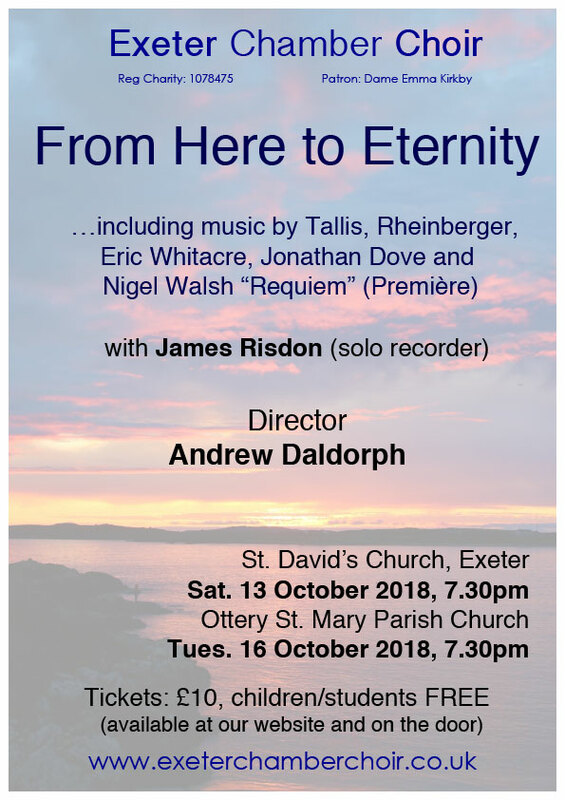 I am delighted to be returning to make two guest appearances with the Exeter Chamber Choir accompanied by their director Andrew Daldorph. Tickets available from the ECC website or on the door. To kick off the new year I am delighted to be giving my third recital at the magnificent St. Alfege Church in Greenwich. I am joined by the wonderful Olwen Foulkes in a programme of canons, echoes, reflections and riffs spanning 300 years. The concert will last 45 minutes and is free of charge with donations invited. It is particularly suited to younger recorder enthusiasts! Braille Music is the subject of a new documentary directed by American film-maker Michael House. It features six blind musicians who come together to record a tribute to Louis Braille. Braille Music in now on Amazon Prime U.K. It’s free to anyone who is a member of Amazon Prime, if you’re not a member, you can rent it or buy it. ‘Hope’ by Zoe Dixon, the piece of music featured in the film, is available on Amazon, iTunes UK and Google Play. I am delighted that the film will be screened as part of the Ludlow English Song Weekend on Friday 6 April 2018. Read more about the film, including the associated piece of music, on this previous news post. Handel and Hendrix in London, 25 Brook Street, Mayfair, London, W1k 4HB. A performance of the charming song cycle Colin’s Kisses as well as other instrumental gems by one of the 18th century’s most distinctive composers. “Sensing Nature” will see the Tactile Ensemble create music inspired by the natural world in the beautiful surroundings of Thornham in Norfolk. Further information can be found on the flyer. As part of the film, we spent two days in Paris, treading the streets where Braille lived and worked. Brilliantly, the classroom where he taught, as well as numerous samples of his tactile code are preserved. Even more extraordinary is that his means of conveying stave notation in combinations of six dots remains largely unaltered and continues to thrive in the digital age. As someone whose study and employment have depended largely on Braille, making this documentary was both very moving and a great privilege. While we eagerly await news of a network broadcast, you can see the trailors and full credits on the IMDB website. Braille Music was premiered at the Montreal International Film Festival of the Arts on 26 March. You can see more at the FIFA website. Zoe Dixon’s setting of Hope by Emily Dickinson, commissioned especially for the film, can be downloaded from Amazon, iTunes UK and Google Play. Proceeds will be donated to the Amber Trust, a charity supporting the musical endeavours of blind and partially sighted young people, including those with additional and complex needs. 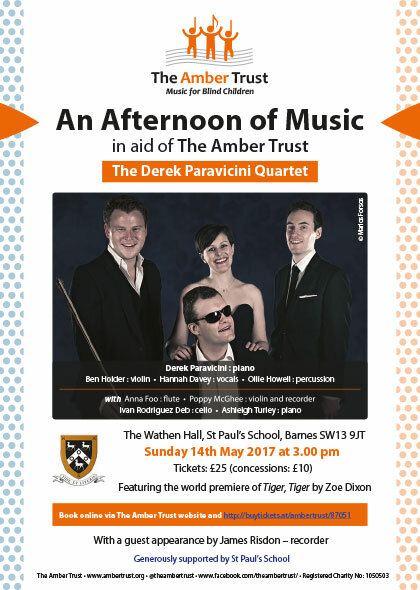 I am delighted to have been invited by the Amber Trust (link to www.ambertrust.org) to perform at their next fundraising concert to support their work with young blind and partially sighted musicians. Amber support some amazing young people and this concert is a wonderful chance to hear some of them. Click to download/print a pdf of the flyer. Programme to include Corelli’s epic ‘La Follia’ and Lloyd Coleman’s ‘Towards Harmony’. If you'd like to get in touch, please go the Contact Page. You can sign up to my mailing list to keep up with my news.